Combine all ingredients and let sit in fridge for 24 hours. Form into rolls, about 3, and wrap up in foil. Make a bunch of tiny holes in the foil with a fork. Put directly on rack to allow the grease to drain/drip off. Bake it at 300 degrees for a little over an hour, cool and enjoy! So……if you load this mix into the stick shooter, and extrude sticks that are the same size, will they not dehydrate more evenly? Good idea with the foil if you have no better way. What is everyone’s favorite brand “stick shooter”?? If the extruded meat sticks are roughly the same size when dispensed then they should be very similar in size upon dehydration. Some variables include the consistency of the ground meat prior to dispensing, any “hot spots” in the oven or dehydrator, and how experienced you are at dispensing the sticks. It’s all about practice with a Jerky Shooter. I’m using a stick shooter that makes .5 sticks. What’s the avarage time it takes to dehydrate them? 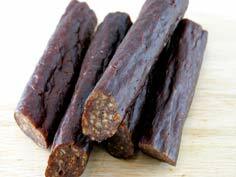 I made some venison salami with the recipe above or virtually the same one. I was a little displeased with the results: They do not look anything like the picture, the ones above are in skins or colagin. The foil wrapped version will leak a lot of fat and water while cooking, so be prepared with juice catcher of some sort. I put a wire rack on a cookie sheet. Also I would suggest adding 2tbsp of your favorite seasoning or it will be kinda plain. Then you will have a great stick or sausage. 2 ways of doing this…….. Copy and paste to one of your templates….like the blank page this is what I do and it works great. I am lovin’ all the jerky recipes. Printing the ones I really like. What kind of lean for groung beef I’m using a 36″ dehydrator and trying sticks for first time, also should I get skins for sticks?